Talenti Organic Ginger Matcha Gelato is made with green tea and ginger steeped in organic cream, blended with Japanese Matcha. Talenti Organic Oak-Aged Vanilla Gelato is made with organic, slow-cooked Madagascan vanilla gelato, elevated with notes of oak. Talenti Organic Chocolate Mousse Gelato is made with organic dark chocolate gelato whipped with egg for a fluffy texture, swirled with fudge. Talenti Organic Brown Butter Caramel Gelato is made with organic caramel gelato swirled with buttery dulce de leche. 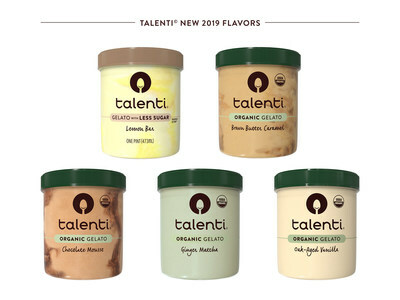 Talenti Crafted with Less Sugar Lemon Bar Gelato — steeped in lemon zest with tangy lemon curd and shortbread bits, sweetened with monk fruit juice. For those who want to be the first in the know, Talenti has launched “The Talenti Scoop.” This Talenti gelato fan club is free to join – once fans sign up, they’ll be the first to know about insider information from the brand and have a chance to receive a few surprises throughout the year.